The oil rally is not justified by market fundamentals, analysts say, but fear and uncertainty will keep upward pressure on prices. 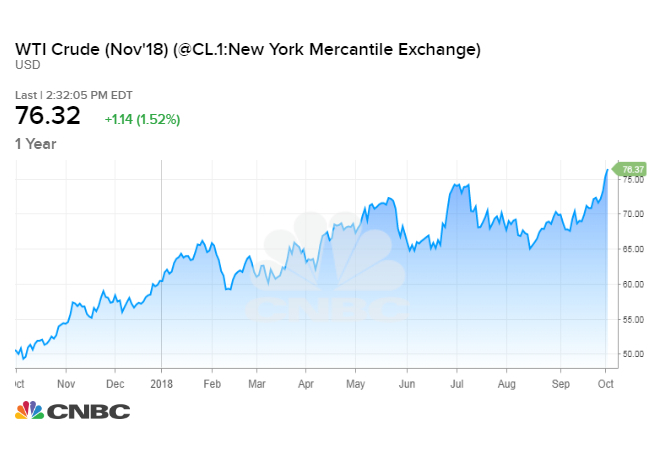 Oil prices are trading at four-year highs above $85 a barrel ahead of Trump's deadline for oil buyers to cut off imports from Iran. Goldman Sachs and Barclays say OPEC can make up for supply shortfalls, but the market is not yet convinced. Investment banks and hedge funds say oil prices have rallied too far too fast, but the fear and uncertainty gripping the market will keep pressure on crude futures in the coming weeks. Brent crude hit a new four-year high of $86.74 on Wednesday, fueled by concerns about a shortfall in global supply as U.S. sanctions whittle away at Iranian crude exports. The market is just one month away from the Nov. 4 deadline that President Donald Trump set for oil buyers to stop purchasing Iran's crude. In May, Trump pulled the United States out of the 2015 Iran nuclear deal and restored sanctions on OPEC's third-largest oil producer. Much of the world — including the European Union, China and Russia — oppose the move, but companies around the world have curtailed their imports from Iran for fear of running afoul powerful U.S. sanctions. That has pushed oil prices higher and left some analysts saying they cannot rule out a rally to $100 a barrel. There are too many questions about how strictly the Trump administration will enforce the sanctions, how many oil importers will ignore the penalties, and how quickly a group of producers led by Saudi Arabia and Russia can turn on the taps. "There's sort of a fever building in the market right now about what the landscape is going to look like in terms of supply and demand," said John Kilduff, founding partner of energy hedge fund Again Capital. That fever will persist until the market determines how many Iranian barrels will come off the market and whether Saudi Arabia is able to step up to fill the gap, Kilduff said. He believes the uncertainty could push U.S. crude prices up another $10 a barrel to $85, until new supply potentially tamps down the cost early next year. U.S. crude ended Wednesday's trading session at $76.41, climbing more than $1 a barrel to its highest since November 2014. Oil prices rallied despite a large 8-million-barrel increase in U.S. crude stockpiles and confirmation of rising output from Saudi Arabia. Saudi Energy Minister Khalid al-Falih announced on Wednesday that the kingdom pumped 10.7 million barrels per day this month, near a national record, and will hike output again in November. "I think the Saudis will ultimately step up, but they're going to be stingy at first," Kilduff told CNBC's "Squawk Box" on Wednesday. "It's going to be a rough winter for consumers at the gas pump, at the heating oil tank, the airlines. Everybody." Saudi Arabia and OPEC have historically waited for supply shortages to develop before raising output, wary that a premature production hike could tip the market into oversupply. But that is cold comfort given the brisk decline in Iran's exports to date. The drop has exceeded expectations, with Iranian exports down about 650,000 barrels a day since April, according to Goldman Sachs. Jeff Currie, Goldman's global head of commodities research, said prices are rising because a lot of investors and oil consumers are buying oil contracts to hedge against the risk of a major supply disruption. At the same time, there aren't enough sellers in the market to relieve the upward pressure on prices. "There's a lot of uncertainty right now. We don't have a clear picture on" Iran, he told CNBC's "Squawk on the Street" on Wednesday. "If you have a sustainable loss in Iran, $90 to $100 is a potential outcome here, but we don't know at this point what's going to happen to Iran." To be sure, Goldman does not think oil will hit $100 because that level assumes Iran's exports will fall to zero, said Currie. Goldman believes Iranian exports will drop by about 1 million bpd to 1.4 million bpd. In that scenario Brent could settle back into a range between $70 and $80 a barrel before year end. Currie believes more Saudi and Russian barrels are on the way, and production from the long-dormant Saudi-Kuwaiti neutral zone could start up within months. He also says the United States has not ruled out releasing oil from the nation's strategic petroleum reserve. "I'm not saying there's not massive upside here, but I think we just have to be a little cautious here and think, 'Hey, it's not an unmanageable position.'" Goldman's position largely aligns with the view at Barclays, which also expects Iran's exports to fall to about 1.4 million bpd. Michael Cohen, head of energy markets research at Barclays, said the rally is built on a series of questionable views. The market is assuming that Iran's crude exports will continue falling at a rapid pace and that OPEC is either unwilling or unable to fill the gap. However, Cohen expects the Trump administration to issue "significant" waivers that will allow oil buyers to continue purchasing some Iranian crude beyond Washington's Nov. 4 deadline. Those waivers, along with the refusal of some nations to fully comply with the sanctions, will slow the loss of Iranian barrels. In Barclays' view, OPEC members have enough spare capacity to cover the drop in exports. Cohen also believes the market is putting too much stock in media reports that Saudi Arabia is "comfortable" with oil prices above $80 a barrel. "The recent increase in prices has gone too far, in our view. Although prices may continue to rise from current levels in October, the market is ripe for a correction," he said in a research note Tuesday. RBC Capital Markets stresses that Iran's response to the sanctions will determine whether the rally can continue. Helima Croft, RBC's global head of commodity strategy, expects Iran to become more antagonistic — restarting some nuclear activity and increasing support for regional militant groups — but expects the regime to avoid outright military conflict. However, if Iran seeks to disrupt oil shipments through busy Middle East waterways, ramps up cyberattacks and withdraws from a nuclear nonproliferation treaty, Croft says the market could add a $10 to $15 a barrel premium to oil prices.